Kt Simpson is a performer, artistic director and founder of Copperdollar Immersive Performance Company as well as the owner of Copperdollar Studios. After leaving school, she studied an art foundation in Cheltenham. She moved to Bristol aged 19 and trained under Sarah Rubridge at the Bristol Community Dance Centre and learnt a huge array of styles before going on Swindon School of Contemporary Dance. She ran away from the contemporary training as she felt that it wasn’t able to give her what she was searching for. It was on a 9 month trip around Europe and India that she found her true passion for entertaining when being taught by a traditional Indian dance teacher and after watching a family of street performers in Agra. Kt was inspired to create the same sense of inclusivity and depth in her own work that played such a large role in the performances she had been so drawn into. Once she returned home from her travels, she met a group of people who were starting up a circus without animals, called Zincali. Kt got a job as a performer and was keen to get involved and incorporate what she had learnt from her travels into her own acts. She learnt to fly with a South African trapeze troupe. Kt then teamed up with a close friend and created a clown acrobatic duo called Bodgit & Scarper which interacted with the audience. Bodgit & Scarper travelled around Northern France where it grew bigger and became a touring midscale circus, acquiring an array of acts, from unicycles to motorbike stunts. After being a part of Bodgit & Scarper for a 5 years, Kt went to Cuba to work with the National State Circus. She was part of a clown themed acrobatic routine called Jugglers for Peace. Although it wasn’t always easy witnessing what went on in Cuba, Kt found herself so welcomed and became attached to the culture and the people she met there. When she came back to the U.K, she lived in Bristol and it was there that she gave birth to her first child, Lui. Kt never stayed in one place for too long and decided to move to Brighton and go to University and study Dance and Visual Art. Here, she was able to use her previous experiences to develop an in-depth knowledge of performance as an art form and her desire to involve the audience in shows developed further. 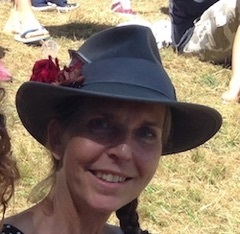 In 2000, Kt had her second child, Georgia and started to worked as a Can Can girl (as part of the group Can Booty Can) at Lost Vagueness in Glastonbury Festival. After 7 years of dancing, Kt knew it was time to do what she had always wanted to do; she applied for funding from the Art Council to research and develop an idea she had been thinking about for a long time. This provided Kt with the funds and time needed to be able to write, direct and star in her own shows, influenced by her personal experiences and background. Kt set up Copperdollar Immersive Performance Company in 2008 and selected a group of performers and artists to work with, some of whom she had known through random encounters, such as fellow parents at a play park, some she knew through the industry, some of which she interviewed and took on board. Her was first show was inspired thematically by the ancient Celtic festival of Samhain and Mexican Day of the Dead. The show celebrated life whilst exploring the concept of the afterlife. It succeeded in drawing the audience into the show as Kt had dreamed of. Copperdollar Immersive Performance Company has been putting on shows at festivals ever since with each show developing further, featuring more details and more elements of dance than the previous year. They have entertained over 50,000 people so far. In 2013, Kt bought what would be the Copperdollar Studios. She’d had her heart set on the building for years and a series of fortunate events lead to her purchasing it. She took 2 years perfecting it and in May 2015, she opened its doors as a space for theatre groups, dancers, photographers and videographers, to name but a few. 2 years on and Copperdollar Studios is a hub for creative, artistic and progressive minds to meet, to work and to continue shaping the world of art. Kt manages the studio and lives with her family in Brighton.